Day six of stims and feeling really good. No bloating, no aches, no bitchiness- just feeling normal. I wonder how long this will last? The daily injections aren’t terribly bad.. J does the mixing and I do the injecting, we are quite a team I must say. Along with daily injections, I have also been pretty consistent with my daily meditations that are specific to taking medication and imagining my follicles growing and wow do these help ease my nerves. The only thing I feel anxious about at the moment is my first baseline ultrasound appointment. I go in on Monday and am praying that I am responding as I should and that we have no unwanted surprises. 36 hours until we find out how my ovaries are responding. She surrendered. She prayed. She leapt. First injection down and many more to go! I woke up early this morning, so early that my room was still filled with darkness. I immediately reached for my abdomen and began to pray. I knew today was the start to something wonderful and amazing and I wanted to pray and send my gratitude’s. This day has been a long time coming and the first injection has been my biggest worry up to this point and boy am I happy to report that it’s now behind me! The injection itself was painless, although I admit; I got stage fright on my 3 count. 1, 2- hmmm I’m being ridiculous now! And then I took a long deep belly breath and let it all out… pinched my skin taught and in one quick like motion- in went the needle. I was surprised at the lack of feeling and had to look closely to make sure that the needle went in- yes sure did. Then I dispensed the medication-all done! Now I need all the prayers I can get. Just to reiterate: I am on the highest dose of medication one can possibly be given.. Dr. S reminded me at my baseline ultrasound appointment this past Friday that he’s “throwing everything he has at me” to ensure that my ovaries respond as well as they possibly can. He also solemnly reminded me that if he doesn’t think he can get five eggs at transfer he will cancel the cycle. Gulp. Did he really need to remind me of this scenario? Shortly afterwards, he performed my antrafollicle count and found 4 follies on the left and 4 follies on the right. He said it was a good start- so here’s hoping! I received an early birthday present and card from my mom over the weekend. This card brought tears to my eyes. She always knows how to pick the perfect cards and this one is no different from the rest. 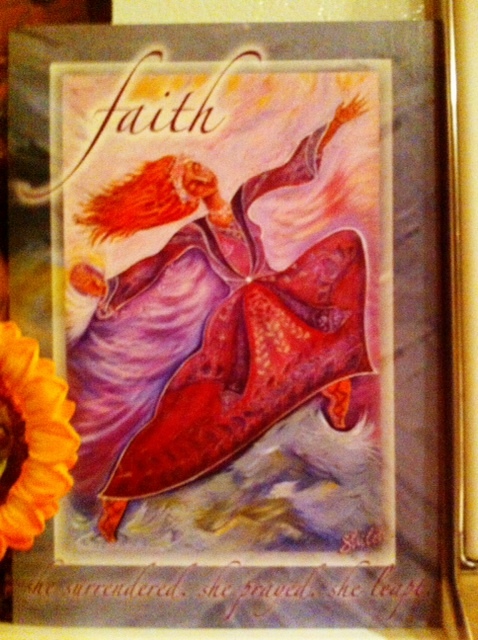 IVF is all about faith, surrendering, vulnerability, and courage. I immediately displayed this card right smack dab on my refrigerator so that I have those beautiful words to look at and remember. In the meantime I’ll be continuing with my daily meditations, weekly acupuncture, and beautiful crisp fall walks with my furry companions to help me get through these next few weeks. Ps: I told my ovaries they are about to have the ride of their life- praying I’m right.